Selkirk Settlers Identified from Past and present of P.E.I., Skye, and Hebridean Pioneers, and Other Sources. View List Reconstruction for the "Dykes"
"Wanted: A vessel to carry 400 passengers from Portrie in the Isle of Sky, to St John's or Pictou, Nova Scotia, to be ready for sea by the first of June. The owner of the vessel to be at the expense of fitting up berths, furnishing water, casks and water with fuel and cooking places. The berths for each person to be 6ft by 18 inches, with the allowance of 56 gallons water and 2 barrels bulk of stowage for each person besides sufficient room to be left in the hold for provisions." The following is an attempt at an accurate passenger list reconstruction for the "Polly", the first of the Lord Selkirk's trio of vessels to arrive on Prince Edward Island in 1803. The "Polly" arrived arrived with her passengers from the Isle of Skye on Sunday, August 7th, 1803. Two days later, the "Dykes" arrived with her passengers, and Lord Selkirk aboard, and the Oughton arrived on August 27th, almost a month later, carrying 40 or 50 Scottish Catholic families from Uist to Three Rivers. Referring to the "Polly", "Her Complement, as Selkirk records in his diary, was "250 full passengers, and nearly 400 souls"" - Hebridean Pioneers, MacQueen, pg. 8. This disagrees somewhat with the following customs registry, perhaps due to the definition of what constituted a "full passenger". Alas, will records ever agree! Offloaded Orwell Bay, carrying some 300 Presbyterian Passengers from the Isle of Skye, under the pilotage of Capt. Thas. Darby. The Inbound Customs Registry, Accession No. 1291, Public Archives and Records Office, P.E.I., shows a date of entry of 8th August, the day after the actual arrival. Unlike a "Polly" listing based upon a door to door survey done for the centennial of the "Polly" arrival in 1903 which is known to contain a large number of errors and inconsistancies, in order to be listed here, there must be one or more independant pieces of documentation proving the person arrived on the "Polly" or another Selkirk vessel. Due to errors introduced in family lore through time, the older the documentation, and the more available, the better. The original documentation is included in footnotes at the bottom of this page. As more documentation is found, there may be additions to those listed on this page. We are hoping to be able to achieve a high degree of accuracy in this listing. This is an ongoing project - If you know of any other passengers known to have been aboard, please let me know. There may be some errors in the following listing - I am not infallible, but it has been checked thoroughly against the original texts. Use is as a guide only. I would like to thank Donna Collings, Gordy McCarville, Mary Edwards and others for their assistance in compiling this listing. The following Table is from Malcolm A. MacQueen's "Hebridean Pioneers", page 73, 74, an excellent history of the Belfast and surrounding district. This was a petition by the people of the district to express their gratitude and respect to the Rev. Dr. Angus Macaulay for his ministrations through the years. I have attempted to cross reference those in the above listing, but in doing so, some assumptions have had to be made, e.g. that father and son would have signed together. Please note that this list was 8 years after the Polly and Dykes arrived and some may have arrived after 1803, and some may be sons who had reached adulthood in the ensuing years. MacQueen states the original is in the possession of Macauley's descendants, the Murchisons of Pinette River. We the undersigned, beg leave to express our gratitude and respect to the Reverend Doctor Angus Macaulay 43 for his unremitted attention in keeping alive true Christian devotion and piety for seven years among us. The greatest part being unacquainted with the English tongue would be totally deprived of clerical instruction were it not for his knowledge of the Gaelic language. We also bear testimony that he hath at his own expense erected a chapel near his house in St. John s Parish where he officiates weekly (when at home) in the neighborhood of several hundreds Protestant souls, solely indebted, under divine Providence, to him. for the blessings of Public Worship and Christian Baptism. We also testify that he preaches occasionally and Baptises the children of several other settlements in this Island, where the people are in our penurious condition, without the means of making any worldly compensation for his voluntary and pious exertions. * Odochardy - MacQueen notes that the surname became Dockerty." HP: Hebridean Pioneers, 1957, by Malcolm A. MacQueen. P&P: Past and Present of Prince Edward Island, 1906, "A concise review of its early settlement, develpoment and present conditions, written by the most gifted authors of the province", edited by the Hon. 's D. A. MacKinnon and A. B. Warburton. SP: Skye Pioneers, 1929, by Malcolm A. MacQueen. SPEI: From Scotland to P.E.I., 1990, 1993, the Prince Edward Island Genealogical Society. Also: Islander 17 May 1861: "At Belfast Cross Roads, on the 10th instant, after an illness of several months, which he bore with christian resignation, Mr. Samuel Nicholson, Farmer, age 76 years. He emigrated to this Island, from Kilmure, Scotland, in the year 1803, and by his kind, inoffensive and christian character, commanded the esteem of all who made his acquaintance. He left a widow and family who mourn the loss of a fond husband and an indulgent parent." From the research of Donna Collings, dcollings@islandtelecom.com. The research of the late Ernest MacLeod shows that Samuel and his wife Flora had 3 children, Henrietta, James, and Christie, all born after arrival on P.E.I. 5 "JOHN NICHOLSON, who successfully operates a fine farm in Lot 6o, Queens county, was born at Flat River, on May 24, 1848, and is a son of John and Catherine (Bell) Nicholson, the father born at Bell Creek, where he followed farming. The paternal grandfather, Alex Nicholson, was born in Scotland, on the Isle of Skye, and was a passenger on the ship "Polly" in 1803, settling at Bell Creek. He was a successful farmer and died in 1820. He married Miss Mary Nicholson and to them were born the following children: Niel, who died in 1888; Isabella, who died in 1844; John, the subject�s father, who died in 1858; Samuel, who died in 1866, in Australia; Alexina, who died in 1883. To John and Catherine Nicholson were born the following children: Isabella, the widow of Hector Morrison, deceased; John, the subject of this sketch; Alex, deceased; Samuel, whose sketch appears elsewhere in this volume; Catherine, deceased, who was the wife of Renold McPhee, of Little Sands, Kings county, where he followed farming; Mary, who is the wife of William Boyd, a merchant and rancher in British Columbia. 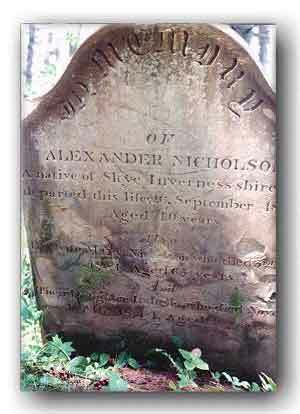 Then in SP, page 41, the transcript of Alexander's tombstone - "In memory of Alexander Nicholson - A native of Invernesshire, who departed this life 26 September, 1820, aged 40 years. His wife, Mary Nicholson, who died 3rd May, 1854, aged 65 years. And their daughter, Isabella, who died November 16, 1844, aged 25." Here is a photo taken in summer 1998, of this stone. It is the sole remaining intact stone in the old French cemetery at the entrance to Lord Selkirk Park in Eldon, where the first of the Selkirk Settlers were buried. 7 "Mr. McLellan married Miss Catherine Mclsaac, a daughter of Roderick Mclsaac and granddaughter of Malcolm Mclsaac, who came on the ship "Polly" from Uist, Isle of Skye. Scotland, in 1803, locating at Wood Islands. To Mr. and Mrs. McLellan have been born the following children: John Alex, Margaret J., Clara Belle and Mary Salena." P&P, Pg. 374. 11 "DONALD McKENZIE, a successful farmer and blacksmith at Flat River, was born in Lot 60, Prince Edward Island, on May 1, 1840, and is a son of John and Elizabeth (Williams) McKenzie. The father was born in Rosshire, Scotland, and was a passenger on the ship "Polly" in 1803, settling in Lot 6o, Queen�s county, where he followed farming. 13 "DUNCAN McRAE, who owns and operates a fine farm of one hundred and sixty acres in Lot 6o, was born at Flat River. Prince Edward Island, in March. 1856. and is a son of John and Christy (McRae) McRae, the former of whom was born at Flat River in 1806. The paternal grandfather, Finley McRae, came to Prince Edward Island on the ship "Polly," from his native Scotland, from whence also came she who became his wife. He settled at Big Point. on Flat River, on the farm now owned and operated by the subject. the land having remained continuously in possession of this family ever since. He followed farming throughout his life, as did also his son John, the subject�s father, who died on March 11, 1888. The latter was twice married, first to Catherine McDonald. by whom he had two sons, Roderick and Finlay, the first named meeting his death by drowning. Subsequently John McRae married Miss Christy McRae, a daughter of Duncan and Margaret (Gilmore) McRae, natives of Scotland, who came to Prince Edward Island some time after the arrival of the "Polly." They were the parents of eight children: Catherine, Angus, Christy, Duncan, Bella A., Roderick, Maggie and Mary. P&P, Pg. 413"
Also: Patriot 25 Nov 1904, [ Died] "The Late Alexander Beaton - Angus Beaton was born in the Isle of Skye and came to this country by the ship Polly in 1803. He settled at Flat River. Two of his sons, Malcolm and Peter, were killed in the war against Napoleon. Donald, his third son left three sons, Malcolm, Peter, and Ronald. Alexander, oldest son of Malcolm, was born December 5, 1826. He taught school for a number of years. He was well versed in the theology of the Bible and tried to live up to his redeemer. He was a kind man and a faithful friend. He died October 28, 1904." 18 "FINLEY MCRAE, a well known and successful farmer in Lot 6o, was born at Flat River, in March, 1840, and is a son of John and Catherine (McDonald) McRae, the former of whom was born at Flat River in 1806. The paternal grandfather, Finley McRae, came to Prince Edward Island, on the ship "Polly," from his native Scotland, from whence also came she who became his wife. He settled at Big Point, on Flat River, on the farm now owned and operated by the subject, the land having remained continuously in possession of this family ever since. He followed farming throughout his life, as did also his son, John, the subject�s father, who died on March 11, 1888. The latter was twice married. first to Catherine McDonald. by whom he had a daughter and two sons. Christy, Finlay and Roderick, the last named meeting his death by drowning. Subsequently John McRae married Miss Christie McRae, a daughter of Duncan and Margaret (Gilmore) McRae, natives of Scotland, who came to Prince Edward Island some time after the arrival of the "Polly." They were the parents of eight children. Also: Argus 9 Apr. 1872 (SPEI p. 43), [ Died] "MacRAE - On 10th Feb Finley MacRae and on 24th Margaret his wife. Emig. in 1803 on "Polly" from Applecross Rosshire." 18a "Captain [Donald] Docherty was a son of Angus and Catherine (McLeod) Docherty, the former of whom was born in Portree. Scotland, and at the age of nine years came to Prince Edward Island on the ship "Polly," accompanying his parents, Donald and Ann (Stewart) Docherty. Catherine McLeod was also a native of Portree, Scotland, and was descended of Lord McLeod, of Portree. She was a daughter of Malcolm and Effie (Mc Donald) McLeod, the latter being of the Glengarry McDonalds." Also: June 25, 1878. Examiner: "At Wheatley River, Sunday June 23, 1878, age 80, died Alexander Ross of Invernesshire, Scotland, and carried to this Island with his father, in the ship "Polly" in 1805"
Also: S'side Journal 2 Dec. 1891 (SPEI p. 20), [ Died] "MacDONALD - At Eldon on 26th Donald R. MacDonald AE 68. Son of Ronald who Emig. 1803 on "Polly"." - Patriot 2 June 1877 (SPEI p. 23), "MacDONALD - On 25th ult Ronald MacDonald AE 77. Native of Skye. Emig AE 3." Also: MacDONALD - Patriot 22 Apr 1871 (SPEI p. 22), [ Died] "At Pinette, John MacDonald AE 80. Native of Isle of Skye. Emig. 1803. This is most likely the brother John (above), who settled in Pinette." John McDonald - Death from the Islander 5 May 1871 pg. 3. "At Pinette, after a few weeks illness, Mr. John McDonald, in the 80th year of his age. The deceased was a native of the Isle of Skye, Scotland, and emigrated to this Island in 1803; he was a deacon in the Baptist Church for many years and his daily walk and conversation were consistent with his Christian profession." From the research of Donna Collings, dcollings@islandtel.com. 30 " Mr. [Michael D.] McCormack married Miss Catherine McPhee, of Big Pond, Lot 45, Prince Edward Island. a daughter of Joseph and Jane (McLean) McPhee, the latter a daughter of Capt. Charles McLean, of the British army. To Mr. and Mrs. McCormack were born the following children, namely: Joseph, of San Francisco; John, who is in the United States navy; Charles; Peter, of San Francisco, California; James; Bennett. of New York City; Cenerus, of Brandon, Manitoba; Alexander, of Providence, Rhode Island: Daniel. who remains at home and is engaged in farming and fishing; Mary Ann, of Providence. Rhode Island, and Sarah Jane. at home. Also: The Islander 12 April 1844: "At Point Prim, on the 29 ultimo, in the 66th year of his age. Mr. Donald McRae, a native of Rosshire, Scotland, and for 41 years a resident in this Island." From the research of Donna Collings, dcollings@islandtel.com. Also: "DOCHERTY - [Died] "At Lot 50 on 25th Aug. Donald Docherty AE 92. Emig 1803 "Polly" with his parents. S'side Journal 1 Sept. 1881 (SPEI p. 10)"
Also: A more complete quotation of the above notice has been provided by Donna Collings: "At Seal River, Lot 50, on the 25th August, Donald Dogherty, at the advanced age of 92 years. He came to this Island with his parents in the year 1803 in the celebrated ship Polly." Also, Gordy McCarville points out an obit in the Royal Gazette 6 June 1848 (Died) "Belfast 17th Donald Martin Age 89. Native of the Isle of Skye Emig. 1803 with Lord Selkirk." Also: The Islander newspaper 9 June 1848 "At Newton, Belfast, on the 17th inst., Mr. Donald Martin, age 89 years, a native of the Isle of Skye, Invernesshire; he emigrated to this Colony with Lord Selkirk in 1803. "From the research of Donna Collings, dcollings@islandtelecom.com. 38 Gordy McCarville points out the stone of Alexander Lamont. This stone is found in Belfast as stone [58-1-811]. It says:" Alexander Lamont, died Feb.10, 1845. Ae84. His wife Eunice Currie, died Aug.11,1859. Ae90. Natives of the Isle of Skye, they emigrated to this Island in 1803. 40 "A. K. HENRY, a successful farmer and miller at Granville, Lot 21, was born at Malpeque, Prince Edward Island, on January 8, 1844, and is a son of Edward and Grate (Hacker) Henry, the father born at Malpeque on March 10, 1814, and the mother in Devonshire, England, on May 19, 1820. The paternal grandfather. Alex Henry, was a native of the Lowlands of Scotland. The great-grandfather. Donald Henry, came to this Island from Kentyre, Scotland, and was one of the first settlers at Malpeque. He married Miss Mary McMullin. The subject�s maternal great-grandmother was a daughter of a Mr. McQuillan, of Elgin, Scotland. and came to Prince Edward Island on the ship "Polly." She had a brother, Charles Russell, who taught school on Prince Edward Island in the seventeenth century. She was the mother of eight children, Charles, Edward, Dugald, Isabella. Mary, Barbara, Catherine and Flora. P&P, Pg. 684"
Also: S'side Journal 30 May 1894 (SPEI p. 47), [Died] "MURCHINSON - At Point Prim on 20th Mrs. Alex Murchinson AE 92. Nat. of Skye. Emig. 1803 "Polly" with her parents Mr. and Mrs. J. R. MacDonald." 43 "In Memory of Angus McAulay, M.D. Chaplain of H. Majesty's First West India Regiment. He settled in Belfast with emigrants from Scotland in the memorable ship, "Polly" in 1803. He died Dec. 6, 1827, aged 67 years. Also his wife, Mary, died April 9, 1857, aged 99, daughter of Samuel McDonald, of Sartle, Scotland, Capt. In H. Majesty's Army during the American Revolution" SP, Pg. 40. The mentioned tombstone is in the "Polly" cemetery in Mt. Buchanan. There are very many more references in SP and HP about the doctor. 45 In the St. John's, Belfast Cemetery, "In loving memory of Mary Douglass, only daughter of Lord Selkirk, died October, 1859, Aet 60. Blessed are the dead. Erected by her daughter, E. McLennan." SP, Pg. 43 Note: Mary probably arrived later, in 1806, in the care of Thomas Halliday, in who's care, Mary was entrusted by the Earl. Mary later married one of Thomas's natural sons. SP, Pg. 42. 46 "Malcolm MacLeod of Glashvin, Skye, and his wife, Effie Macdonald, of the Glengarry branch of that clan, arrived in Belfast, on the "Polly" in 1803." Also, daughter Christina, "Christina, born Skye about 1782, d. in Orwell, about 1862, wife of Donald Macqueen, with issue." SP, Pg. 136.; HP, Pg. 17. Also: Palladium 24 Oct. 1844 ( SPEI p. 37), [Died] "MacLEOD - Pinette 29th Sept Malcolm MacLeod AE 98 Nat. of Skye. Emig. "Polly" 1803 with Lord Selkirk." 47 "Donald Macqueen, of Skye, and his wife Christina MacLeod [see above note 46], daughter of Malcolm MacLeod (later of Glashvin, Pinette), emigrated on the "Polly". After living for a few years near Macaulay's Wharf, Glashvin, Pinette, Donald Macqueen died, and was buried in the French Cemetery, Belfast, P.E.I." Also "Christina, b. in Skye, about 1802. ", likely accompanied her parents. SP, Pg. 143. 48 "Among the several families of Nicholsons who arrived on the "Polly" was that of John Nicholson of Stensholl, Skye, and his wife Jane Martin." Children and descendants then listed ch. Hannah, Rachel, John, and Donald Nicholson, miller, of Orwell. SP, Pg. 153. Also: S'side Journal 4 Feb. 1886 (SPEI p. 49), [Died] "NICHOLSON - Orwell Cove on Jan. 21st, Mary, relict of John Nicholson AE 86. Emig. 1803 on "Polly"." Believed to be wife of son, John above. 49 Genealogy of the Mutch Family, by J. R. Mutch, 1985, Catherine Nicholson was born, Isle of Skye, 1780, and arrived on P.E.I. on board the "Polly"
50 "Among the emigrants on the Dykes in 1803, were Findlay Macdonald and wife, Jessie MacKinnon, both from the Isle of Mull, Scotland. They settled in Point Prim. They had six sons�." HP, Pg. 35. 51 " Simon McKinnon, who was a son of Charles and Janette (Fraser) McKinnon, was born in Inverness-shire, Scotland, and, with his parents. came to Prince Edward Island in 1803 on the ship "Polly," " P&P, Pg. 649. Also, memorial stone (793) in the Belfast church yard which states that Charles and Janet were 1803 arrivals. 53 "Hector's wife was Isabel Fraser, daughter of Donald Fraser, of Portage, Belfast, and his wife Christine MacTavish, emigrants on the Polly, 1803." HP, Pg. 36. 54 Gordy McCarville points out that a MacTavish was the "first child born among the Selkirk Sellers". This is confirmed by a newspaper account of his death (the Islander, 25 July 1862) "At Belfast on the 22nd July Thomas MacTavish Age 59. Was the first born among emigrants of Selkirk families from Scotland in 1803." This would suggest a Mr and Mrs MacTavish, a widow MacTavish, or a Miss MacTavish gave birth to this child sometime between Aug.7 and Dec.31 1803 in Belfast area. Also: The Islander 13 May 1853 "At Orwell, on Thursday, the 29th ultimo, Mr. Samuel Martin, aged 107 years. The deceased emigrated to this Island, from the Isle of Sky (sic), some fifty years since, amongst the first settlers; was a sober, industrious man, and a good neighbour, and was able to walk about to within a few weeks of his death." From the research of Donna Collings, dcollings@islandtelecom.com. 56 Presbyterian & Evangelical Protestant Union 24 May 1877 - Deaths: At Lot 57, on the 28th March, Mr. Malcolm Buchanan in the 76 year of his age. He was a native of the Isle of Skye, and emigrated to this Island in the year 1803. Likely a "Polly" settler, but could have arrived on the Dykes. 57 Presbyterian & Evangelical Protestant Union 14 Jun 1877 - Deaths: At Flat River, on the 4st inst., Malcolm Beaton, in the 79th year of his age, a native of the Isle of Skye, Scotland, and emigrated to this Island in the year 1803, in the ship 'Polly'. 58 Patriot 18 Aug 1904 - Obituary: The funeral of the late Donald McEachern, which took place from his late residence in Summerville, Lot 64, on August 2nd prox. was very largely attended by neighbors, friends and relatives. By his death one of the oldest, qiuiet, inoffensive and most respected men has been removed from this section of the country. His remains were interred in the beautiful quiet cemetery of Belfast beside the sleeping bodies of his two little girls who proceed him to that heavenly rest from which there is no waking. The funeral ceremonies were conducted by Rev. Sinclair, Montague, who had kindly attend him during his affliction. The late Donald McEachern's parents who are all interred in Belfast Cemtery, emigrated to the Island from Scotland on the good old ship "Polly". In educational matters Mr. McEachern took a great interest, three of of his children having attended the P.W. College and one the O. (C) B. College. He leaves to mourn a sorrowing widow, who never left his side during his sickness, and attended him as only a kind and loving wife could do, four sons and seven daughters, all of whom except one were present at his death and funeral. The sons are Charles, James, Almore in Summerville; Wm. J. in Mount Albion. The daughters are; Mrs. Frederick Richards, Cherry Valley; Mrs. Fredrick Theday (Thoday), Sarfaide, Mass. ; Mrs. Peter Stewart, Mount Albion; Mrs. Alex. Campbell, Summerside; Mrs. Geo. Sutherland, Cardigan; Mrs. Wendall Lea, Vernon River; and Ethel at home. Further, from a very old MacDougall family history, it mentions "Three of those brothers, Duncan, Edmund, and Andrew married three sisters, daughters of Duncan MacEachern, who came from Scotland to PEI on the ship "Polly" August, 1803, and settled in Belfast", further proof of MacEachern's arriving aboard the Polly. The MacDougall's who married Duncan MacEachern's daughters arrived on P.E.I. seven years later on the Selkirk vessel, "Phoenix" in 1810. Thanks to Paul MacDougall for this information. 59 Islander 30 Mar 1866, [Died] "At Flat River, on Monday, the 12th instant, Donald Ross, sen. aged 82 years, after a lingering illness of 9 months, which he bore with Christian resignation. He was a native of Skye, Scotland and emigrated to this Island in the year 1803. He was deservedly regretted by all his acquaintances, and has left a large number of children and grand children to mourn their berevement." Also: Charlottetown Herald 26 Nov 1884, [Died] At Victoria Cross, on the 5th of November inst., after a few weeks of severe illness, Mary Ross, the beloved wife of Mr. Ronald Lamont, of that place, in the 66th year of her age, leaving a sorrowful husband and a family of three sons and three daughters to mourn their loss. she was the third daughter of the late Donald Ross, of Flat River, who emigrated from the Isle of Skye, in the year 1803, in the ship Polly. 60 Patriot 19 Oct 1874, [Died] "On Saturday, Oct. 3, in the 78th year of his age, Donald Gillis, an old and respected inhabitant of Orwell Cove. He emigrated to this Island in the ship Polly, in the year 1803. He leaves a large circle of friends and acquaintance to mourn their loss." 62 Herald, 27 June 1888, [Died} "CAMPBELL - On 17th ult AE 97 Angus Campbell. Native of Western Islands of Scotland. Emig. 1803 'Polly'"
63 Patriot 2 June 1877 (SPEI p. 12), [Died] "FURNESS [ROSS] -- On 24th ult Ann Ross, relict of Jno. Furness AE 91. Native of Kilmuir, Inverness. Emig 1803 "Polly". 64 Herald 6 Jan. 1886 (SPEI p. 12), [Died] "GILLIS -- At Flat River 3rd Jan. John Gillis AE 83. Native of Rosshire. Emig on "Polly" 1803." Not believed to be the same individual as #39 - That John Gillis came from Invernesshire, and died two years later. 65 Presbyterian Evangelical Protestant Union, 15 May 1884 (SPEI p. 24), [Died] "MacEACHERN - At Lot 66 on 6th Margaret, relict of Charles MacEachern AE 92. Native of Inverness. Emig. 1803 "Polly"." 66 S'side Journal 9 Apr. 1891 (SPEI p. 34), [Died} "MacLEAN - Lot 16 9th ult Sarah MacKinnon AE 95, relict of Donald MacLean Native of Mull Emig. 1803 "Polly"." 68 Patriot 1 May 1875 (SPEI p. 49), [Died] "PANTING - On 10th Jane Fraser relict of Francis Panting AE 83 Native of Inverness. Emig. 1803 "Polly"." 70 Weekly Examiner 16 Dec. 1892. (SPEI p. 60), [Died] "MacLEOD - Pt. Prim Nov. 25, Mary, relict of William McLeod AE 92. Last, but one, of passengers on "Polly" in 1803. Leaves 3 sons 2 daus. Obit p. 2." Also from David Ian Gross g. g. grandson of William and Mary, a large quantity of documentation. From the obituary of William and Mary's son, John, born 26 July, 1827, and baptised along with sister Janet on 28th of August, 1827 as per St. John's Belfast church records. (Other children of John and Mary are listed with later baptism dates): Port Elgin, N.B., April 5  - "John McLeod, who has been seriously ill for the past three months, died at his home here at 4 o'clock Sunday morning. Mr. McLeod was the oldest resident of Port Elgin, having arrived here from P. E. Island in 1852, when this town contained but twelve houses. He was the son of William McLeod, who with his wife, were passengers from the Scotch Highlands in 1803 on the historical ship "Polly" which brought such a number of the original settlers to the "Garden of the Gulf"...."
As mentioned, the baptisms for John and Mary's children may be found in St. John's records (including Mary's maiden name, Lamond). William and Mary both arrived as children (about age 3) aboard the vessel with their respective parents. Obviously, if they arrived with parents, the parents also arrived on the Polly. However, as we cannot at present be certain of the parent's names, they cannot be listed by name as passengers on this list by name. Some sources believe the parents were Malcolm MacLeod and Effie MacLeod, and Mary's, Alex Lamond and Ms.(poss. Eunice, both listed above, number 38) Currie. With presently available documentaion, this connection to those names cannot be proven. Certainly, they did arrive with parents, and for that reason, the parents are listed as arriving under the listing as Mr. and Mrs. MacLeod and Mr. and Mrs. Lamond pending further information. 71 Islander 4 Mar 1864 p. 3 (SPEI p. 4), [Died] "BUCHANNAN - On 12th ult. At Belfast, John Buchannan AE 80. Native of Isle of Skye. Emig. To PEI in 1803." Likely a "Polly" settler, but could have arrived on the Dykes. 72 Weekly Examiner 18 July 1879 (SPEI p. 23), [Died} "MacDONALD - Ch'Town 3rd, Capt. Samuel Murdock McDonald AE 32. Son of Capt. Donald (Hector) McDonald & Flora Mutch; grand-son of Hector McDonald who Emig. in 1802 with Earl Selkirk." If taken literally, this may indicate that he didn't arrive on the "Polly", but that he arrived aboard the Dykes. 73 The Prince Edward Island Magazine Vol III, 1901 "Remniscences of Seal River", pages 194, 195: "Mr. Fraser married for his second wife Isabella McKay.".... "He had a young family by the second marriage growing up - three boys and two girls. The boys names were William, Donald, and John - the girls Margery and Margaret. So he decided to emigrate to America, and in the spring of 1803 he, with some hundreds of others set sail for the wilds on America in the celebrated ship, "Polly". Also: From Early Settlers of Vernon River, Apr. 06, 1906, publication unknown: "Somewhere around that time, 1812, John VanIderstine and Jeremiah Enman sailed about two miles up the river. They married the only two daughters of John Fraser, who were passengers on the Polly." Note: The Vaniderstine letters on our Letter Index state that John Van Iderstine's wife was named Nancy or Ann. The letters clearly indicate that Margaret Enman and William and John Fraser were Uncle's to the sons of Nancy Fraser Van Iderstine. We do not know if Margery was a nickname or if this information on the names of Mr. Fraser's daughters was given incorrectly in "Remniscences of Seal River". From the Examiner, 7 Dec. 1882 P. 2: "The funeral of the late Donald Fraser, Seal River, passed through here last Saturday. He died at his residence in the 90th year of his age. Mr. Fraser emigrated from Scotland on the ship "Polly" and was one of the early pioneers in this section of the Island." Finally, from the obituary of a son born to John and Isabella after the arrival of the vessel, From a 1908 newspaper: "The death occured on February 26th at his home at Vernon River Bridge, of Mr. Edward Fraser, in the 73rd year of his age, after an illness of several months. Deceased was a son of the late John Fraser, who emigrated to this country in the ship, "Polly" in the year 1804 (sic) and settled in Seal River......"
My thanks for this information given me by Ronald F. Fraser, Falmouth, Maine. 74 "The Island Magazine", No. 5, Fall-Winter 1978, pp. 35 & 38 tells of Roderick (Rory Roy) MacKenzie as one of the "Bards on the Polly". It also quotes his Gaelic poem of their hardships and an English translation. The book "Pioneers of Malagash", p. 40ff, states "He came to Prince Edward Island in 1803, and settled in Pinette, Belfast[sic]. He left the Island in 1810 and came to North Shore of Malagash [NS]. He died on the Gulf Shore." Roderick, his wife Catherine (Kennedy), sons Colin and Malcolm, and daughters Mary? and Elizabeth have been generally accepted to have arrived on the Polly. 75The Daily Examiner, Sept 16, 1881: "Died on the 7th inst. Mrs McLaren, relict of late John Mclaren, Heritage Grove, Ch'town Royalty, age 87; in 1803 immigrated in the "Polly" Mother of the first Prince Edward Islander who went to the the Old Country to be educated for a profession. Her son, Dr. MacLaren is now a successful surgeon in St. John's NB...she leaves a large family of children, grandchildren and greatgrandchildren." Does anyone have her maiden and fist name? Protestant Union 31 Dec 1885: " At Peter's Road, Lot 63, on the 16th inst of apoplexy, Margaret Wetherbie relict of the late James Carver, aged 87 years. She leaves three sons and one daughter and one grandson and a large number of relatives and friends to mourn the loss of a kind and affectionate mother and neighbour. She emigrated to this Island in the Polly. Maud, settled with her parents in Lot 49. She became a convert under the preaching of the late Rev. Donald McDonald, and has been a faithful adherent to the gospel ever since. She died trusting in the merits of a crucified Redeemer. also: The research of the late Ernest MacLeod shows Mary above as arriving with her parents, Roderick McLeod and wife "Miss" McKenzie along with children Christie, Mary, and Jessie aboard the Polly in 1803. John (Stensholl) Nicholson, her husband, was a son of John Nicholson, wife Jane Martin of Orwell Cove. 82John MacDonald of Kinloch, Isle of Skye and his wife Margaret MacDonald of Kilmuir, Isle of Skye - John Kinloch Macdonald was born in Kinloch, Isle of Skye. He married on Skye, Margaret Macdonald who was from Kilmuir on the Isle of Skye. According to the book "Prince Edward Island Past and Present", they were closely related to the Macdonald chiefs of Sleat, and direct descendants of the Lords of the Isles. In speaking of Allan Macdonald, (Margaret's brother), the book says of him "He was a man of exceptional parts, and an ideal gentleman, derived from a long line of illustrious Scotch ancestry, and a direct descendant of that Macdonald whom Scott has immortalized as "The Lord of the Isles". The Macdonalds of Kinloch were his very near relatives, and one of them, Donald Macdonald, "Kinloch Donhull a Rudha" was the nearest relative of the "Lord of the Isles" that left Scotland for America." - "Prince Edward Island, Past and Present" published by B. F. Bowen & Co., Charlottetown; edited by D.A. MacKinnon & A.B. Warburton., 1906. John was noted (PEI Land Conveyances Liber 26, folio 347) as having purchased 100 acres in lot 57 from the Earl of Selkirk's agent James William. The transaction was recorded on April 4, 1806, and it stated that John was "now and for sometime" had been in possession of the land. The purchase price was 25 pounds. (In 1821 he also leased another piece of land - 94.5 acres adjoining his 100 acre farm from the Trustees of Lord Selkirk for the sum of 5 shillings per annum (Liber 27, folio 361) They moved a few years later, and took up a beautiful 400 acre farm in Orwell Cove, where they were known locally as the "Kinloch Macdonalds." Margaret MacDonald, spouse of John MacDonald (Kinloch) died August 20 1860 age 46. John (Kinloch) died August 18 1885 age 82. Came from Skye on the "Polly". 83Peter Campbell, wife, 3 sons, including Angus who later removed to Middle River, Cape Breton. Large quantity of documentation: See "Angus Campbell of Cape Breton"
84 In reference to Polly Passenger John MacPherson, Ann Beers married John MacPherson, they lived at China Point on the farm later owned by by Charles and Elizabeth Musick Nelson. John MacPherson came in the Ship Polly [not confirmed whether 1803 crossing]. He had 23 children and went to Anticosti (Island) and died there at the age of 103 years. One daughter by his first wife Ann Beers married Thomas Mellish, a daughter Mary married Malcolm Stewart and the youngest Ma(y) married Nicholas Robertson of Mt. Albion. Malcolm Stewart lived at Belfast. Note: Ann Beers was the daughter of Joseph Beers UEL and his first wife Nancy/Ann Ames. Title: Record of Beers, Hayden and Allied Families in U.S. and Canada (PAROG-Beers-69), page 1. Anyone have more documentation for John? 85Daily Examiner, February 7, 1906: "Death of Mrs Margaret McLaren, 103, widow of the late Archibald McLaren, Jan 28, 1906; born on the passage from Scotland on the ship Polly, 1803....2 sons, 2 daughters, buried Brudenell, Jan 30 beside her husband who predeceased her 30 years ago." Transcription from Christine Gorman. 86Daily Examiner, October 13, 1906: "Death of John McDonald, Glashvin, Belfast, son of Murdoch McDonald, who came from the Isle of skye on the ship Polly. John was born about 1812, eldest of ten children, brother of Mrs. Edmund Briggs, Newton, Belfast, never married, (not date of death.)" Transcription from Christine Gorman.